It’s been 35 years since Ridley Scott’s seminal masterpiece ‘Blade Runner’ was released in cinemas, and whilst the long awaited sequel has been highly anticipated with stunning reviews, I approached it with a degree of trepidation. 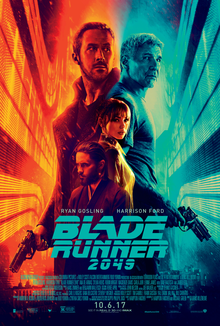 Set 30 years later and titled ‘Blade Runner 2049’ after the year it is set, the film follows Officer K (Ryan Gosling), an advanced replicant who has now taken on the duties of a ‘Blade Runner’, a task previously undertaken by humans. The original ‘Blade Runner’ was a visually stunning, wildly inventive and thought provoking piece of science fiction, and I’m pleased to say that the sequel more than lives up to expectations. In another summer of blockbusters, it’s rare to say that one of the smartest and most original movies is a sequel, and I thought it was truly excellent. The Los Angeles of ‘Blade Runner 2049’ has the same visual look as the original, but the sense of decay feels heightened, with more dust, even more rain and a stronger feeling of a world in terminal decline. We’re 30 years further down the line and the human workforce has been replaced by more advanced replicants, no longer restricted to off world colonies, and the Tyrell Corporation has been superseded by the Wallace Corporation, led by Jared Leto’s mysterious Niander Wallace. It’s a film very much interested in the same themes as the original film, with a lot of time devoted to exploring what it means to be human and how important that really is in a world that has been the victim of human neglect. Ryan Gosling is perfect in the leading role as Officer K, a character constantly trying to reckon with who he really is, and Harrison Ford makes an equally powerful return that delivers a crucial link between this film and the original. This is a film that will require your full attention, and I must confess I had some challenges following every development at the beginning of the film, but the slow burn is worth it when the narrative starts to reveal its secrets. Visually it’s absolutely stunning, shot superbly by master cinematographer Roger Deakins, and superbly directed by Denis Villeneuve, who really gets what ‘Blade Runner’ is all about. The iconic soundtrack from Vangelis has been replaced by beautiful work from Hans Zimmer and Benjamin Wallfisch, which manages to capture the essence of Vangelis without feeling like a direct copy. Denis Villeneuve is one of the best directors operating right now and he’s delivered an astoundingly beautiful, masterfully crafted movie. This is an intelligent film encompassing deep, weighty science fiction themes without sacrificing the thrilling intensity that drives the narrative along, and I couldn’t be happier that it’s as good as it is.